It has always been my dream to eat Thanksgiving in Manhattan so that I could prepare a fierce cheese plate for the occasion. Thankfully, the occasion came tumbling by and so I found myself at Murray’s last Tuesday, dodging raindrops to buy glorious cheese – “as whiffy and local as possible,” I entreated the cheesemongers. Served with a shmear of strawberry-balsamic jam and a goblet of malty Belgian brown ale, C Local became the platform for my best bite of the weekend. Turkey is lovely, cranberry sauce, too, but nothing beats a beefcake slathered with preserves. Let your mind wander. Meanwhile, I’ll tell you about this controversial crescent. Back in October, The New York Times wrote about C Local and stirred up a lot of dander over the term affinage (off-ee-NAJ), the process of aging cheese. Cheese shops nowadays engage in a lot of playful tinkering with rinds, and skilled mongers trained in affinage will take in young orphan cheeses and bathe them in spirits to produce a unique specialty. C Local is a case in point. The mongers receive wheels of a bloomy sheep's milk cheese, called Kinderhook Creek, from Old Chatham Sheepherding Co., and instead of selling them right away, the folks at Murray’s wash these wheels in Brooklyn Brewery's Local 2. By tending to the cheese, they produce a very different product – a one-of-kind wheel that’s sold in limited quantity, often at a premium. For someone like me, this is a treat. I love the cheeses produced by Old Chatham, and the beer wash morphs these gentle bloomies into something cantankerous and slightly crusty – just to my liking. In the Times article, cheese god Steven Jenkins (author of Cheese Primer) ranted against this practice, attacking cheesemongers for ramping up costs to the consumer and creating a class war among cheese buyers. His response lit up Twitter for several days. While I am all for equity, I don’t understand Jenkins’ crowbar tongue on the subject of affinage. Ripening cheese requires skill in the same way that, say, refinishing a table requires skill. If I buy a refinished table, I expect to pay the person who slathered on the varnish and attended to final touches. All this to say, C Local was the highlight of Thanksgiving. Seek it out. And ask for Syd, cheesemongress extraordinaire. She helped me pick out the stunning accoutrements for my New York Locavore Cheesegiving. The day's bounty is detailed below. Around the holidays, there’s always a flurry of emails from friends and readers about what cheeses to serve and how to arrange them. Here’s the hot scoop on selecting and serving. It’s easy to get overwhelmed at the cheese counter this time of year. That’s why I like to arrive with a theme in mind. This year, I went for a mushroom cheese board, just for something different. Last year, I divined a Monastic Cheese Plate. You could also go by country (French, Italian, or Spain) or pick American all-stars. When in doubt, choose a variety of milks – cow, sheep, goat, and if you can find it: water buffalo. Make like the picture above and set out your cheeses before guests arrive. 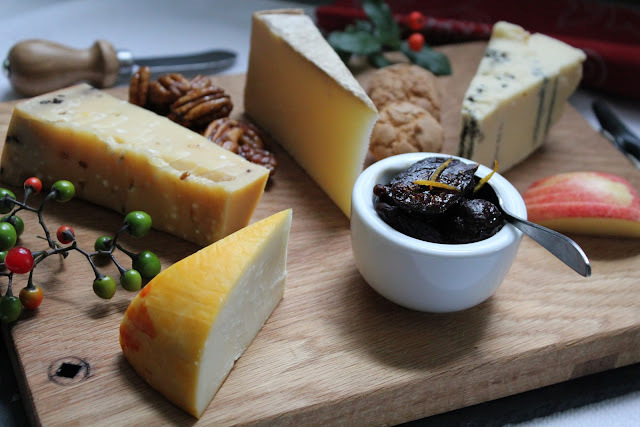 Cheese is always best served at room temperature. Cover your cheeses with some damp cheese cloth or a damp kitchen towel so that they don’t dry out. If you spend a pretty penny on gorgeous cheese, for heaven’s sake don’t put out sad crackers. A slice of plain baguette is the best raft for a gorgeous mouthful. Put out some honey, dried fruit, a few nuts, and some cured meat, if you like. Don’t worry about perfect pairings. Guests will have fun mixing and matching. Store leftovers in waxed paper. When the party’s over, wrap your firm cheeses in waxed paper or parchment – they keep better that way than in Saran. Store your gooey creamies in a plastic tub or jar. Bag your blues and keep them separate from other cheeses so that those beautiful blue spores don’t spread. Enjoy! And remember to talk to your cheesemonger. This is high season for cheese counters and there are gorgeous delights in stock. If you need a primer on how to talk to a cheesemonger, please read the post and let me know how it goes. When I was small, my Swiss grandmother used to make yogurt at her home in Cleveland. I remember eating it at her long kitchen table. She’d set it out in a large bowl along with a jumble of preserves, and we’d spoon away the afternoon, eating cool yogurt with dark jam. As an adult, I’ve always wanted to make yogurt and although I’ve made a few batches using commercial yogurt as a starter, I’ve never mooned over the results. Usually, it turns out sour, requiring oodles of sugar to smooth it out. When I read about heirloom yogurt starters on The Kitchn back in September, I felt a little flutter in my belly. No, not that kind of flutter. It was a flickering memory of my grandmother’s silky Swiss yogurt -- tart but not sour, soupy rather than thick. Now, Greek yogurt is in vogue, but I prefer the European version, especially in the morning – the kind of yogurt you can pour over granola, the kind of yogurt that does not taste cloying or gelatinous. Villi yogurt starter from Cultures for Health makes a superbly light, delicate yogurt that is similar to what my grandmother used to make. A single box contains enough powdered starter to make two “mothers,” or starter batches. The directions are easy -- you stir half the starter into a cup of cold milk, cover the jar with a towel, and let the mixture culture in a warm place (70-78 degrees). I used the oven and left the light on to create enough ambient warmth. In about 18 hours, I had yogurt. With yogurt, one batch begets another, so if you time things right – making yogurt every week or so – you can keep using the step-mothers from the original mother batch. Cultures For Health was kind enough to send me a sample of their Villi Yogurt Culture, per my request. And this family-run company has also agreed to give away a sample box of yogurt starter to a Madame Fromage reader. If you’re interested in receiving a yogurt starter of choice, just drop your info here. I'll select a randomly drawn winner a week from today, on Saturday, Nov. 26, 2001. Cultures For Health sells a variety of heirloom yogurt strains (including vegan yogurt starter), cheese-making kits, and cheese cultures, alongside starters for sourdough and kombucha. I look forward to trying some of their other yogurt strains and keeping a fridge full of mothers, if only because this sounds preposterous. Ever since I read Michael Pollan’s Omnivore’s Dilemma, I’ve had a yen to forage for mushrooms. In gritty Philadelphia, it’s a lot easier to pop down to a farmers’ market and simply buy them from a local grower since nearby Kennett Square is a fungi hub. Recently, I did some mushroom sleuthing at Di Bruno Bros. in order to build a Thanksgiving tribute to my two favorite foods: fromage et champignons. My dream: a cheese board that would remind me of walking in a forest. To continue reading, please click here. Full disclosure: This is part of a paid series I write for Di Bruno Bros. Twice a month, I select a cheese and develop a post for their blog. This is how I cover the cost of my dairy habit. Kittens, on Tuesday, November 8, at 8 p.m., I’ll be part of a live podcast from L’etage, the cabaret bar above Beau Monde’s cozy creperie in South Philly. Come join me, won’t you? Wear something sparkly? Or stay home and listen to the show on Used Wigs, a local site devoted to "quality workaday distractions." 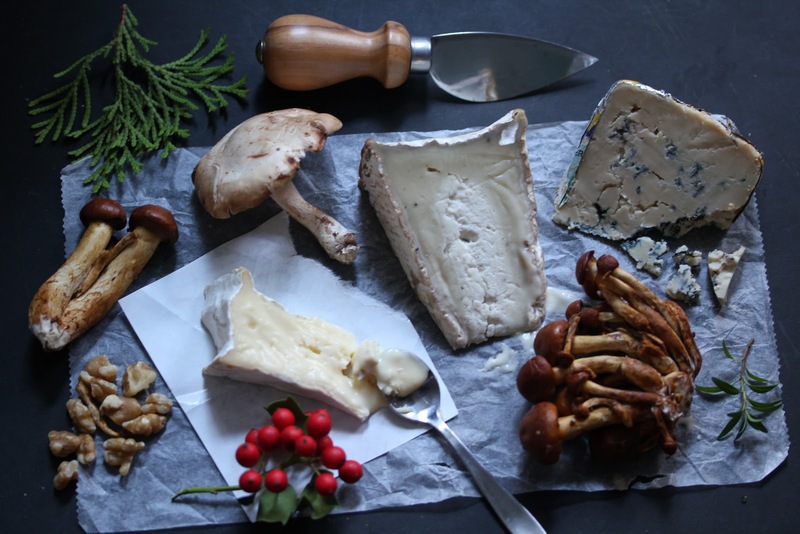 As a distraction, I’ll be sharing some dramatic cheeses as part of my act – cheeses with wild stories, cheeses wrapped in leaves, cheeses made from faraway islands inhabited by special sheep. And by special, I do mean special. If you have ever wanted to hear fairytales and eat mouthwatering cheese simultaneously, before bed, this is your chance. I will feed you delicate things. You will never be the same. To be clear, Used Wigs hosts monthly podcasts at L'etage. I am simply a guest. Many thanks to Russ Starke, host and visionary. I’m sure you feel it, too. The craving. When you catch a whiff of musty leaves on your walk to work, or when pull on a wool sweater that still smells a little sheepy -- those earthy, beasty smells make you want one thing: stinky cheese. No? Seriously? Okay, I’m alone here, or maybe you just don’t want to admit it. There is something about November weather – all this dampness and decay – that makes yeasty, feisty cheeses kind of appealing. In the cheese world, people shy away from using the word “stinky” or “whiffy.” Most mongers and makers will use the term “pungent,” as if this is a kindler, gentler way to refer to certain “interesting” cheeses with “aromatic” qualities. I prefer not to tiptoe. Stinky cheese has always been all right with me. I like to eat it with dark bread and dark beer, preferably in a darkish kitchen with maybe a little Hüsker Dü playing in the background. Stinky Føttene is a good gateway stinker. “For a stinky cheese, it’s pretty palatable,” my friend Austin said, when I served him a wedge at a recent harvest party. My friend Tracy deemed it “the IPA of cheese.” I’d have to agree. Our wedge – airdropped in from a Wisconsin source – didn’t necessitate any nose plugs. Still, it had all the qualities I like in a stinky washed-rind cheese: a gooey orange rind (from a good wash with saline or booze), a creamy texture, and a toothsome beef-stewy quality that is characteristic of stinky cheese. What makes a cheese stinktastic? Most are washed-rind cheeses, which is a style of cheese that developed out of monastic cultures. Many early monasteries produced beer or spirits alongside cheese, and some sweet bald Man Of The Cloth finally put the two together. Think of Epoisses, a famous Googoo Cluster from the Trappists. Washed-rind cheeses are literally bathed in a solution – brandy, beer, etc. – that adds flavor and moisture. No surprise, eating these stinkers alongside Trappist ales and dark liquor makes for a very merry pairing. If you are sensitive to stink, ask a cheesemonger to help you find the right round for you. Stinky cheeses tend to get whiffier as they age, so ask for a young buck. In the store, the cheese might hit you like a herd of rowdy bulls, but at home – with the right condiments and libations – you’re going to find that it lows like a calf. Below are some great seasonal stinkers. I like to serve these before a big meal – or as a meal – because they pair well with other strong flavors, like pickles, cured meat, dark beer, spiced nuts, and even marmalade. Ardrahan – Ireland’s version of a stinky cheese. It’s so gentle, it purrs. Anton’s Red Love – It’s a stinky pillow-top, which means Not Too Stinky. The texture is silken. I could sleep on this, it’s so featherbed good. Red Hawk – A not-too-stinky dream puff from California's Cow Girl Creamery. Rich and faintly peanutty. One of my favorites. Hooligan – Plenty stinky but so delicious. Think of a cow barn with a tire swing -- you’ll taste both. This is one elegant but intense cheese, and it’s made by a former English teacher and his mom, in Connecticut. Oh, please. It’s cute and stinky. It’s the Hello Kitty of Stinky Cheeses. Stinking Bishop – Need I say more? Epoisses – The only cheese I serve on Thanksgiving Day, always with baguette rounds and celery sticks. It’s the dip du jour for stink-loving Brady Bunchettes. Limburger – A truly repugnant smelling cheese that has the taste and texture of onion frosting, although it never tastes quite as strong to me as it smells. One man makes Limburger in the U.S., and he tells me it’s good on toast with a smear of strawberry jam. I like to make Limburger Helper. Full Discosure: Stinky Fottene was sent to me as a sample, among other Wisconsin whiffies that I requested for a Thanksgiving Cheese Board. Last month, the Wisconsin Milk Marketing Board invited me to put together a Thanksgiving cheese board using cheeses from my home state. How could I resist? Wisconsin produces some of my favorite Cheddars, Alpines, and Blues, so I ordered a dozen samples I wanted to try, then set about to creating. I also came up with 2 recipes for pairings -- Maple Balsamic Pecans and slow-cooked "Drunk" Figs. You'll find the recipes at the bottom of the post. I like the first cheese on a cheese plate to be creamy and mellow. Port Salue has a soft texture, and its orange rind offers a festive burst of color. You could also lead off with Les Frères or Petit Frère. Maybe you noticed my earlier post about this curious aged Gouda, studded with cloves and a hint of cumin. It tastes like the holidays, and it pairs nicely with slow-cooked figs and a snifter of brandy. I've wanted to try this blue-less blue since I saw it win a medal at the American Cheese Society this summer. It tastes like strong Cheddar with blues playing in the background. In winter, I love to end a cheese plate with a gutsy Stilton-esque number. This strong blue from Hook's pairs well with nuts and figs. Serve this cheese plate before dinner with a round of Old Fashioned cocktails or dark beer; after dinner, break out the sherry or port. Baguette rounds, oat crackers and amaretti cookies make lovely accompaniments, too. Line a cookie sheet with parchment paper and preheat your oven to 325˚ F. Combine maple syrup and balsamic vinegar in a small mixing bowl, then add pecans and stir until well coated. Spread mixture onto parchment-lined tray and bake for 15 minutes, until pecans are bubbling and browned. Sprinkle sea salt over warm pecans. Once the nuts are cool, store them in an airtight container at room temperature for up to a week. In a slow cooker or sauce pan, combine boiling water and honey, stirring until blended. Then add halved figs, orange zest, orange juice, brandy and spices. The figs will plump up as they cook and are best stored overnight in their juices before serving. Refrigerated, these keep almost indefinitely. Saturday's cheese tasting at Tria put me in the mood to cook with big blues. Lo, when I came across a recipe for Roquefort Meatloaf in a dog-eared copy of The Silver Palate, I knew I had to make it this week. Today, it appears in my column on the Di Bruno Bros. blog. This is a good recipe for the winter months. It's hearty, company-worthy, and it keeps well. 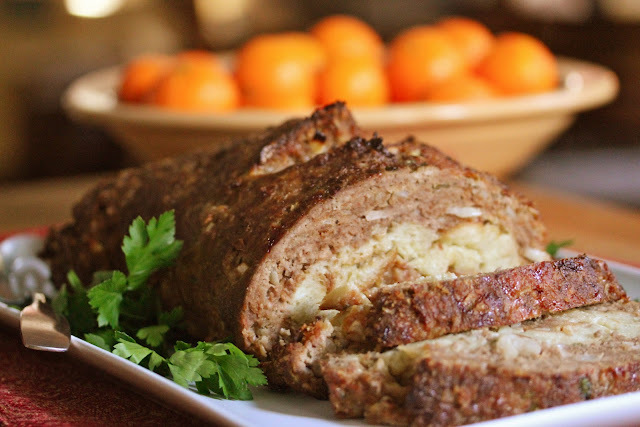 It's also crazy delicious -- this from someone who is not a big meatloaf lover. Consider this the luxury liner of meatloaves. The center is like bread pudding, light and fluffy, while the exterior is dense and toothsome. If you're tired of serving turkey for Thanksgiving, this could be your salvation. It's a bit of a project, but on a wintry afternoon when the house is cold, why doesn't want to rock a fur hat and roll up a meatloaf? For the recipe, please click here. I've had a recent obsession with clove-studded Gouda. I know, I know, it doesn't sound appealing. But around the holidays, this curious cheese is delicious alongside mulled cider. A few weeks ago, I invited our painter friend Mike Geno over to help me dismantle a Wisconsin-themed Thanksgiving cheese board I put together -- and by "dismantle," I mean devour. Mike was struck by the appearance of this cheese, which looks like a hunk of marble full of rusty nails. 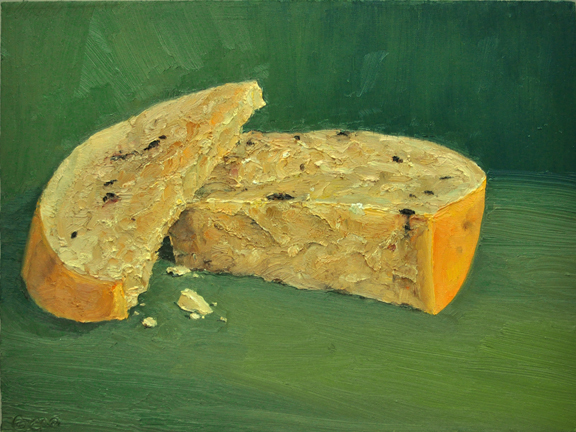 He took it home to paint, one more in his series of luxurious cheese portraits that will appear in the winter issue of Culture Magazine. If you have a hankering to try this cheese, visit Holland's Family Cheese. This family-run dairy farm produces a variety of aged and flavored Goudas, and while I'm not usually a fan of gussied up cheeses, this one is both intriguing and balanced. It's made by Marieke and Rolf Penterman who moved from Holland to Wisconsin and are now producing award-winning cheese.